40+ Or Safe Seniors 50+ Program - We Change Lives TM. As you age, it’s important to build your resilience and find healthy ways to cope with life’s challenges. 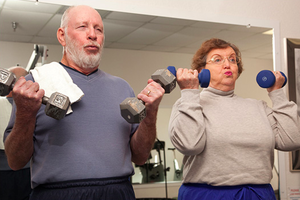 Reaping the rewards of exercise doesn’t require strenuous workouts or trips to the gym. It’s about adding more movement and activity to your life, even in small ways. Whether you are generally healthy or are managing an illness—even if you’re housebound—there are many easy ways to get your body moving and improve your health. Our Minimax method: Provides maximum results with least amount of time and effort. Our coaches & trainers work with a variety clients from functional quadriplegics to seniors training for the Olympics. Research shows that regular exercise and strength training helps you look and feel younger, stay active longer, and Improve Brain Function. First we start by defining your goals and what you want to get out of your workout. We have several programs designed to improve health, balance, active lifestyle and more. Next, we use a series of functional movement screens to assess balance, mobility, stability, strength, coordination, movement and, of course, posture. From here our coaches use a 360˚ approach to achieve your goals. Weight loss coaching if necessary. Our fitness centers have state of the art equipment to help you achieve maximum results with the least amount of time and effort. Or utilize our mobile fitness programs with state of the art mobile equipment to provide fantastic and fun routines in the venue of your choice. Kirk Texeira has been in the health, fitness, and wellness industry for many years and is also the chief instructor for our program. As a Master Fitness Trainer, Obesity Survivor and AARP member he understands the positive results of aging with dignity, living strong, living long and thriving. If necessary, we will work with your doctor. Post Rehab, & Weight Loss if needed. Our Goal is to Restore & Maintain Functional Movement and Thrive. Experience Kirk’s MiniMax Method, which provides maximum results with least amount time and effort. It helps you look and feel younger and stay active longer. Kirk Texeira B.Sc., CMT, ARTS, AETS, FMSL1-CRT, and Adv. Sports Nutrition Specialist, is a licensed, Nationally-Accredited Certified Personal Fitness Trainer, Health & Fitness Facilitator, and Motivational Speaker. The owner is a San Diego Native, SDSU Trained Scientist & PreMed Grad. 40+ & The Safe Seniors 50+ Program TM.